Computer networking company Cisco Systems has surprised the market by forecasting sales that fell short of analysts' estimates. Revenue in the fiscal second quarter will be somewhere between $10.1bn (£6.2bn) and $10.3bn, said the company in a conference call. This is short of analysts' predictions of $11.1bn. 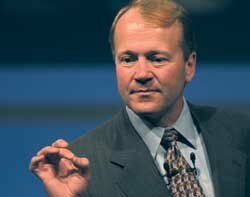 According to Reuters, John Chambers, Cisco's CEO, warned of "short-term challenges" in Europe and public sector spending, as well as weakness among service providers. However, the company reported solid results for its first quarter to October of an 8% rise in profit to $1.9bn and 19% revenue growth of $10.75bn.